THE ROANOKE REFORMATORY...er, sorry ....MT. 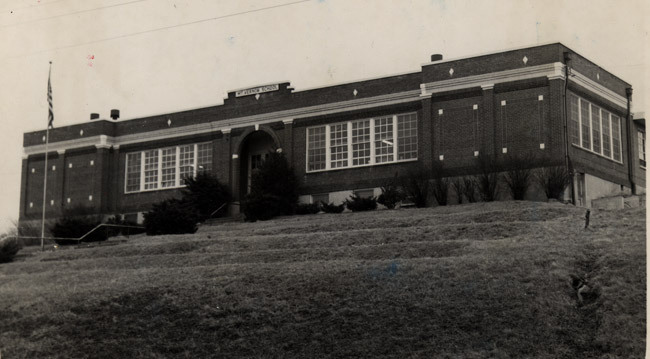 VERNON ELEMENTARY SCHOOL. On my first day of school, I hid under the 'wraps' in the coat closet with Doyle. The class had a unisex bathroom. I had seen girls coming out of it and thought it was 'girls only'. When I came home in tears with soaked pants, mom explained to me that boys also used the bathroom. The best times were out on the playground. In the second grade I organized several other boys based on a sketch of an extensive underground clubhouse. We convened with shovels the following Saturday for groundbreaking in an empty lot. The plan was soon abandoned.